Atwell played Agent Peggy Carter in the 2011 American superhero film Captain America: The First Avenger. MTV Networks' NextMovie.com named her one of the "Breakout Stars to Watch for in 2011". Atwell voiced Carter in the 2011 video game Captain America: Super Soldier. 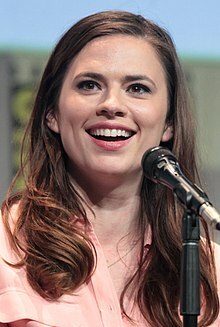 She reprised the role in the 2013 short film Agent Carter, the 2014 film Captain America: The Winter Soldier, and in the 2015 films Avengers: Age of Ultron and Ant-Man. As Carter, she appeared in two episodes of the ABC television show Agents of S.H.I.E.L.D., and as the lead role in Marvel's Agent Carter, which aired from 2015 to 2016. Agent Carter was cancelled by ABC on 12 May 2016. She also provided Carter's voice in Lego Marvel's Avengers and Avengers: Secret Wars. In 2015, Atwell played Cinderella's mother in Disney's live action adaptation of Cinderella directed by Kenneth Branagh. 2012 Playhouse Presents The Banker Episode: "The Man"
2013 Black Mirror Martha Episode: "Be Right Back"
Wikimedia Commons has media related to Hayley Atwell.